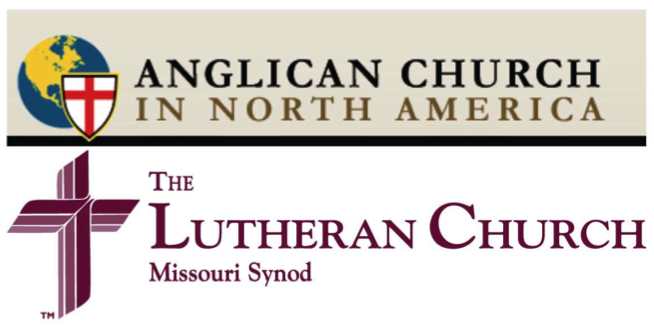 After four meetings over the past 18 months, the Anglican Church in North America and The Lutheran Church—Missouri Synod (LCMS) rejoice in affirming core teachings of the Christian faith they share. The two church bodies, together with the Lutheran Church—Canada, are jointly releasing a report today summarizing the areas of agreement. Leaders from the two church bodies began meeting in the fall of 2010 to discuss theological and ecumenical issues for the purpose of increasing the level of mutual understanding and affirmations between them, and identifying potential areas of cooperative work. Because the Anglican Church in North America includes congregations in Canada as well as in the United States, a representative from Lutheran Church—Canada, an LCMS partner church, also participated in the discussions. "In a time when there is a widespread failure to recognize the biblical teaching regarding the creation of man and woman and their biblical roles, life-issues, and other grave challenges that society faces, it is a joy to find a group of Christians within the Anglican Church in North America who affirm this biblical teaching, and who desire to cooperate in externals with the Missouri Synod in upholding the biblical natural law in society,” said the Rev. Dr. Matthew C. Harrison, President of the LCMS. “Our churches share much in common in the confession of the ecumenical creeds, but we also have differences in doctrinal belief. Hermann Sasse noted that churches who can honestly discuss where they have disagreements in doctrine are in fact closer to each other than churches who cannot discuss such matters. With the Anglican Church in North America, the Missouri Synod can discuss both where we need to seek more agreement and where we have sufficient agreement to cooperate in externals. May Christ bless His church and work unity in both doctrine and practice." The report on the discussions includes a statement of the beliefs the church bodies have in common. These include a shared belief in the Triune God as confessed in the Apostles’, Nicene and Athanasian creeds; justification by grace through faith; the centrality of the Sacraments for the Christian faith; and the infallibility of Scripture. The report also outlines areas about which the church bodies plan to engage in further study and discussion. These include the value of authoritative theological confessions, matters of ecclesiology and the office(s) of ministry, the understanding of Christ’s presence in the Lord’s Supper and differing views on the usage of the western liturgy. 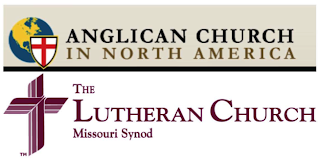 “It is a great blessing to be walking alongside The Lutheran Church—Missouri Synod. We share an unwavering commitment to the authority of Scripture and have been able to support each other as we take a bold stand for the historic faith. It has been a particular joy for me to come to know President Matthew Harrison. We look forward to continuing our work together for the Gospel through prayers, evangelism, dialogue, encouragement of one another, and joint efforts to help those in need,” said the Most Rev. Robert Duncan, Archbishop and Primate of the Anglican Church in North America. The Rev. Dr. Robert Bugbee, president of the Lutheran Church—Canada, added, "Because the Anglican Church in North America includes congregations and pastors in our country as well as the U.S., Lutheran Church—Canada is deeply grateful for the opportunity to send a representative and to be involved in these discussions. Despite the decay in foundational Christian teaching among mainline churches in North America, the Lord is opening doors for us to encourage each other to root our work in the apostolic Gospel of Christ and in the Scriptures as God's infallible Word. Our people in Canada will continue to follow this story with interest ... and with their prayers." ACNA has more in common with LCMS than TEC. I was in LCMS for many years. There is great compatibility here. If LCMS will affirm apostolic succession, and be willing to accept the legitimacy of all streams of Anglicanism in ACNA we could be looking at altar and pulpit fellowship. This is really a natural sorting process in the conservative/liberal realignment. Yeah! Nice to hear. I left a disfunctional AMiA congregation and am very happy in the LCMS congregation I joined. While there are some theological differences, the LCMS is solid in its theology and has recently even joined with the U.S. Catholic bishops in opposing Obamacare's assault on religious freedom and abortion. ACNA has also joined with the Catholic Bishops against Obamacare's assault on religious freedom and abortion. Anglican Church calls eviction "blessing"